The SPCA of Anne Arundel County (AACSPCA) has an active and vibrant volunteer program. We greatly depend upon our dedicated volunteers to help us care for our homeless animals and have a variety of opportunities available for volunteering, outlined below. Volunteers must be 18 years of age or older to volunteer on your own. We do have an adult/teen program for teenagers, aged 13-17, who want to volunteer. The adult and teen must each complete a separate application. Please note that adults can only volunteer with one teen at a time. If you are interested in volunteering individually or in the Adult/Teen program, please fill out our Individual Volunteer Application Form. Help us to give every shelter dog the chance to get out in the fresh air and get exercise. Brighten a shelter dog’s day by taking him or her for a walk on our 5.5-acre nature trail at the headwaters of Back creek. Our volunteer dog walkers make life better for our shelter residents and enjoy a nice walk themselves. Once a volunteer has had several months of practice walking our dogs, we offer additional opportunities for assuring our dogs stay happy and healthy until they find their forever homes. Working on enrichment activities and using our dog play yards are just two examples. The more experienced you become in working with our dogs, the greater your influence will be on them having satisfying lives while at the AACSPCA. Our cats love the opportunity to be petted, groomed, and shown affection. Our cat socializers brighten the lives of our cats while enjoying the playful affection of our feline residents. Socializing with them helps make them more adoptable and better pets. Stimulation and regular human interaction are important ways to help do this. We have kitties of every age and personality and they all thrive on socialization every day. Come volunteer and meet new friends, feline and human. Our petite suite residents – rabbits, guinea pigs, rats, mice, hamsters, gerbils, and the occasional ferrets or chinchillas love to be petted, groomed, and shown affection. Our petite suite socializers brighten the lives of our petites. Socializing them helps them to become more adoptable and happier, healthier pets. Stimulation and regular human interaction are important ways to help do this. 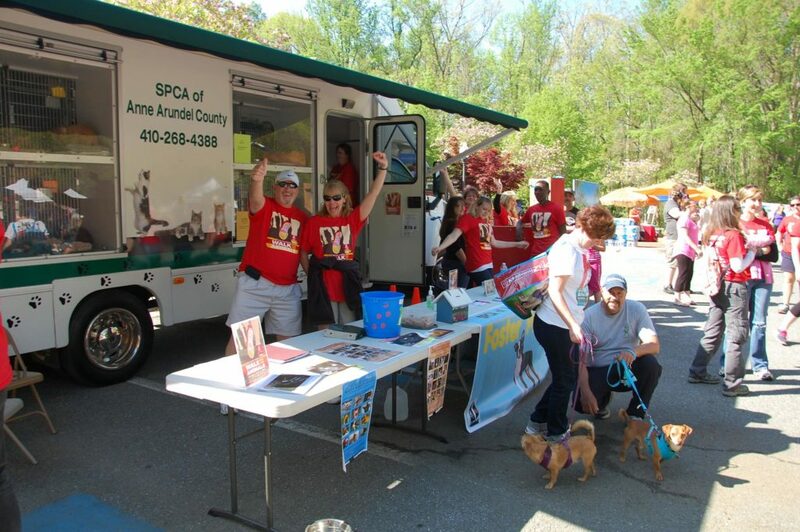 The AACSPCA participates in and manages a significant number of events throughout Anne Arundel County, Maryland, most of them showcasing our adoptable animals. Our volunteers are integral to our success in performing outreach in the community, highlighting the care we provide to homeless animals and making those perfect animal/adopter matches. Participation in events can include anything from working at our larger events, like our annual Walk for the Animals, to bringing a dog, cat or other adoptable animals to a variety of weekly events. Participating in our events is a great way to help the AACSPCA and make new friends. Because our volunteers will be handling our animals in a public setting, participating in events and showing our animals to potential adopters requires additional training. The two-hour session is open to all current volunteers at no additional cost. After receiving your application the volunteer coordinator will send you a payment invoice and once the payment has been received, you will be invited to attend a volunteer training session. Acceptance of your application and training correspondence is done via email. Please be sure to include a valid, current email address on your application. We also offer a variety of group volunteer activities throughout the year. If you are interested in volunteering as a group, please fill out our Group Application Form. Group volunteer activities do not include working directly with the animals in any capacity. If the group includes volunteers under the age of 18, the group will provide sufficient adult supervision while volunteering at the SPCA of AAC. Volunteer applications are reviewed on an individual basis and selection and placement of volunteers is based on the current needs of the AACSPCA. Upon selection, the Basic Volunteer Training Classes will be required. As of now, there is a 2 month wait to get into the Basic Volunteer Training Class, if you are still interested in volunteering, please submit the online application below. During the months of June, July, August, November, and December training classes are limited to a couple times a month. Due to our stringent volunteer training and commitment requirements (6 months / 6 hours per month), we are unable to accommodate (a) middle school, high school or college students who are required to fulfill short-term community service or service learning hours or (b) any type of court-ordered community service. While the AACSPCA occasionally requests assistance for specific events from The Anne Arundel County Volunteer Center, local schools, and community groups (i.e. Girl Guides / Boy Scouts) these situations require no training, animals will not be handled, and the participants are not official AACSPCA volunteers. If you are unable to help as a regular AACSPCA volunteer or via a community project, we hope that you will consider supporting our lifesaving work in other ways, such as helping collect donations for our wish list. If you have any questions about your application, email volunteer@aacspca.org.